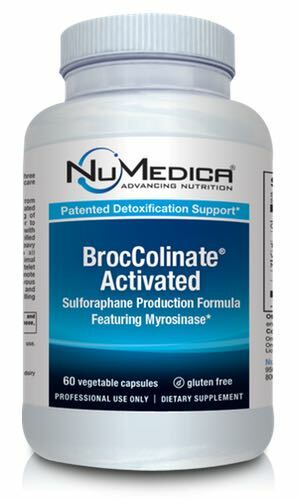 NuMedica BrocColinate Activated contains high amounts of the heavily studied and multi-patented ingredient sulforaphane glucosinolate, which is the most powerful, naturally occurring inducer of Phase II Detoxification Enzymes. Sulforaphane glucosinolate must be enzymatically hydrolyzed (broken down by a chemical reaction with water) to be converted to it's active form sulforaphane. Sulphoraphane is produced when the enzyme myrosinase cleaves to the glucose group from sulforaphane glucosinolate. In the gut of healthy individuals, sulforaphane glucosinolate is metabolized by myrosinase thereby aiding in the conversion to sulforaphane. However, in individuals with a compromised intestinal microflora, this conversion process may be disrupted. BrocColinate Activated has been specially formulated to preserve myrosinase, providing the highest sulforaphane potential in the body. NuMedica BrocColinate Activated brims with powerful nutrients found in broccoli and broccoli sprouts. This scientifically designed formula provides double the protection found in other formulas. NuMedica BrocColinate offers a wealth of benefits that include antioxidant protection, enhanced immune system function, improved detoxification, and even offers chemoprotective properties. Because this nutritional supplement also supports heart health and joint protection, it is regarded as a well-rounded formula that may enhance your health in so many ways. NuMedica's exciting BrocColinate Activated is scientifically formulated with Sulforaphane Glucosinolate. This potent antioxidant is found in broccoli sprouts. Studies have shown that Sulforaphane Glucosinolate may help the body ward off diseases such as cancer and cardiovascular disease. You may have long heard that broccoli is loaded with nutritional properties, and this antioxidant is one reason why. The problem with broccoli itself is that some cooking preparations can decrease the presence of its excellent nutritional support. NuMedica BrocColinate Activated features a clinically tested and multi-patented formula that offers many great benefits. As an antioxidant, this supplement can support immune system function and reduce the presence of tissue-damaging free radicals. Free radicals are associated with disease onset. They can also speed up the aging process. Antioxidants offer natural protections against these harmful molecules that plague our bodies. NuMedica BrocColinate Activated can also boost the body's natural cleansing processes to more quickly remove toxins from the body before they can do damage. This also makes it a great chemoprotective supplement. With its ability to protect colon and prostate health, reduce blood pressure, and support joint tissue health, NuMedica BrocColinate Extra Strength is popular among a wide array of people who understand its many healthful benefits. NuMedica BrocColinate Activated - 60c 1 Capsule 60 Take one capsule once per day or as directed by your healthcare practitioner. Other Ingredients: Proprietary blend (containing myrosinase enzyme and calcium ascorbate), Hydroxypropyl methylcellulose (vegetable capsule). When did NuMedica come out with BrocColinate Activated? NuMedica released BrocColinate Activated in September of 2017.